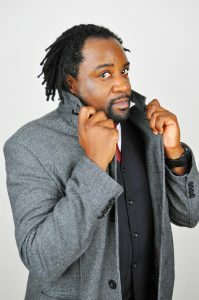 Lester McLean is a native of Toronto, Ontario and has been active on the city’s busy music scene since the early 90’s. He studied jazz as a saxophonist while earning a Bachelors Degree in Mass Communications and Sociology at York University. Although he performed as a lead vocalist in high school, he resumed singing with a serious focus in the late 90’s. The instrumental funk-fusion band The Colour of Soul was the first outlet for McLean’s songwriting and under his leadership the band recorded and released 3 Independent records in 1998, 1999, and 2002 respectively. The next endeavour was The Lester McLean Trio featuring Lester on lead vocals and Soprano Sax, Juno award winning and nationally recognized Michael Occhipinti on acoustic guitar, and multi-instrumentalist Louis Simao on upright acoustic bass. The trio released a full-length CD entitled “Best Foot Forward” in 2005. Drummer Mark McLean guests on a few tracks. The disc features a collection of covers and originals, 5 of which were penned by Lester. Fast forwarding to 2009, the band went into John “Beetle” Bailey’s Drive Shed Studio for sessions that resulted in the 2011 release “Lester McLean – LM: 4, 3,2,1” which features 12 originals all penned by McLean and 3 covers. LM: 4,3,2,1 continues to demonstrate Lester’s versatility with a wide array of musical styles and genres, great melodies, thoughtful lyrics, ear catching grooves, thick harmonies, and the soulful, eclectic sound that defines Lester McLean’s listening tastes and talents. Since the release of Lester McLean – LM: 4, 3,2,1, Lester has expanded his already wide array of talents by taking up congas, djembe, and other percussive instruments which has increased his demand as a freelance artist. When the tribute band Elton Rohn came calling in 2013, Lester answered and is the 7th member of the group on Saxes, percussion, and backing vocals. This is a role that he enjoys and it shows. Fast forwarding to March 2014, Lester again found himself in the studio with his long-time friend and former Colour of Soul band mate bassist/producer “jk” to start the sessions that what would become “A Mostly A Cappella Christmas” released in December 2014. This album was a collection of original compositions and the culmination of a long-time dream come true. If all of these qualities are not enough, Lester’s skills a musician are complimented by his dynamic stage presence. His drive and passion for music and live performance show no signs of diminishing.